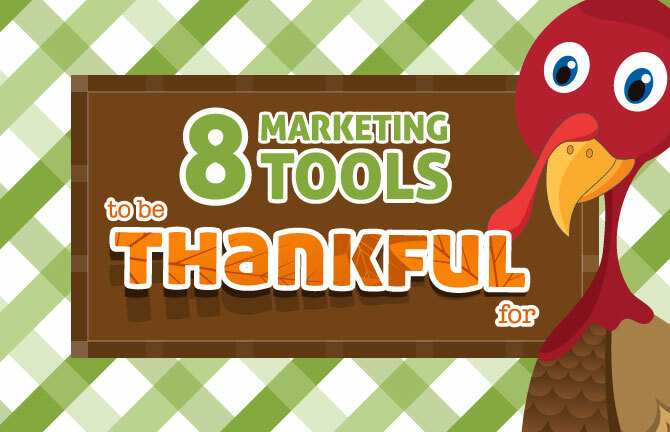 Thanksgiving is a special time to be thankful – for family, friends, coworkers and even for fantastic tools at our disposal that help make us successful. We at Array would like to share a few tools we love and use. Ready? Let’s go! 1. Project Management — Basecamp allows teams to work in a collaborative and well-structured environment, with this web-based system. Basecamp offers an intuitive suite of tools, inexpensive yet highly valuable premium features, and an environment that scales well as your business grows. 2. Analytics — Google Analytics is indispensible for monitoring your website traffic. A solid understanding of peak times can be vital in capitalizing on the ‘how’ and the ‘why’ that causes traffic increase. In addition to Analytics, Google also offers handy little tools like alerts, calendars and apps for business, making it even more appealing. 3. File Management — Google Drive has become one of the most impressive services for creating, editing, saving, syncing and collaborating on documents. Along with its companion apps Google Docs, Sheets, and Slides, there’s little question this is one of the sweetest office packages you’ll find. And it’s all free! 4. File Sharing Service — Citrix ShareFile started as a simple way to exchange files, but has since grown to offer sizeable online file storage, sharing and management. Aside from simple sharing, its reliability, data security and innovation makes ShareFile the go-to solution for businesses, big and small. 5. Social Media Management — HootSuite is one of the most popular social media management tools to track and manage a business’ social network channels. From one web-based platform, businesses can monitor what people are saying about their brand and respond instantly, as well as execute campaigns across multiple social networks. 6. Presentations — Prezi, a cloud-based software, leverages the concept of 3D zooming and transitions and creates effects that captivate and engage the audience. Prezi provides the ability to use better style and effects in presentations to create a feast for the eyes. 7. Passwords — Passpack is a highly secure way to manage user names and passwords. With Passpack, businesses can give staff, partners and even outsourced workers access to a centrally managed password repository without worry that unauthorized users can access trade secrets and customer data. 8. Collaboration — GoToMeeting is a tool we couldn’t live without. With a simple user interface and easy screen sharing capabilities, this web conferencing solution is a quick, affordable solution to make communicating with clients effortless, whether they are overseas or right next-door. At the end of the day, there are countless marketing tools to help you and your business improve your bottom line. But in the spirit of the season, we’re especially thankful for you the customers, community members and readers who truly are a gift to know! We wish you the happiest of Thanksgivings and hope you enjoy this great holiday season!